As any WordPress plugin, GamiPress can work on multisite installs with the default behavior of keeping configured data per site. This means that activating GamiPress on a network site, all points, achievements and ranks will be independent of other site. But since 1.4.0 version GamiPress has a new way to work on multisite installs when is network wide active. GamiPress has the ability to centralize all the data on multisite installs when is network wide active. This means that all GamiPress data like points types, achievements, ranks and logs will be centralized and common for all sites in network. All user data like points balances, earned achievements and current ranks will be centralized. Shortcodes and widgets placed on any sub site, will reconogize this configuration and will show all the data with support for this configuration, as well as links placed to see the achievement or rank single page. Network Activate: Using this option super admins can activate a plugin across the network. Activate: They can also activate a plugin for the main/root site. Individual Sites: Lastly they can allow individual site administrators to activate a plugin themselves. When you log in to your WordPress multisite’s main site, you will be able to see two different plugins screen. The first one is on the main admin sidebar. It is for plugins installed and available for activation on your main site. The second plugins screen is located under My Sites -> Network Admin -> Plugins. This is where you will install new plugins and manage them for the entire network. Click on Network Activate to active GamiPress to the entire network and GamiPress will start working automatically with network wide support. After activate GamiPress to the entire network you will be able to access to the GamiPress menus accessing to you main site dashboard (and just from the main site, sub sites will not shown this menus). Just configure, the points, achievements or ranks that you want and automatically GamiPress will centralize everything to get it accessible network wide. One of the main doubts you will have is how you should activate an integration when GamiPress is network wide and the integrated plugin is just on a sub-site. Simply, activate the integration network wide too. GamiPress will be configurable just on main site while will continue working on background on all sub-sites. Every GamiPress integration will do the same but with an extra condition to check if the integrated plugin is on this sub-site, so the integration code just will be executed on main site to let you configure it and on sub-sites where the integrated plugin is active to catch the events and features related with him. GamiPress offers some specific events that let’s you to focus an action to a specific post, like setup an achievement step for commenting on the “Sample” page. 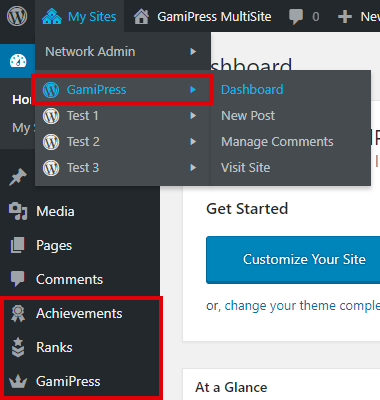 When GamiPress is network wide active, automatically the specific post selector field will let you choose any post located on any sub-site letting you setup configuring requirements focused on post from any sub-site like commenting on the “Sample” page from “Blog” sub-site and commenting on the “Product” page from “Shop” sub-site.